Single day, short term, and annual policies available. Vendors can secure coverage. Parades, overnight events w/camping, and more. No limit on event size. Having access to top carriers that specialize in serving affluent clients sets you apart from the competition. Big "I" Markets connects you to two of the best in the business for high-value clients. Identity theft is like termites or a pipe in the wall with a slow leak; it can take months or years to come to light all while doing considerable damage. Children are particularly vulnerable because it could be many years before the theft is discovered. It may be revealed by a credit monitoring service, or when trying to get a mortgage, car loan, or credit card. The thieves could have been draining accounts, setting up credit cards and lines, securing loans, stealing your home, filing for your tax refund, receiving wages reported to the IRS, getting medical services and/or filing fraudulent medical bills, among others. 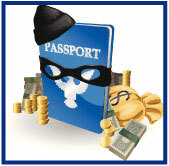 Besides financial losses, criminal identity theft can have other consequences. You may get pulled over for a broken taillight and find yourself getting arrested for an outstanding warrant, if an identity thief gave your information when arrested and didn't show up for his or her court date. You get turned down for a job if a potential employer sees a "felony arrest" on your record. Identity theft is just one of the risks that Chubb addresses in this booklet, "Cyber and Identity Theft: Managing Your Family's Risks." The booklet covers risk types, how they happen, how to try to prevent them, and what to do if they happen to you or your family. It covers personal cyber extortion (a growing trend) and includes tips from the FBI on protecting yourself. The Chubb Masterpiece Program is available to registered members in all states except auto in HI, KY, MA, NC, SC and VA as those are being placed in the legacy-ACE system. Additionally, NJ auto and NC home business are being written in the Chubb Non-Masterpiece environment. Learn more by logging into www.bigimarkets.com and clicking on "Affluent Program-New Business." Join us Tuesday, February 28 from 2:00 - 3:00pm EST for "Chubb Masterpiece - An Overview"
Meghan Jackson, DC Business Development Manager for Chubb Personal Risk Services, will present a "back to basics" view of the Chubb Masterpiece policy and contrast it with the ISO contract. The first webinar in what will be a larger educational series will review the various property policies offered (deluxe home, condo, co-op, city home, and vacation home) and the bells and whistles that come with each one. Click here to register. Big "I" Markets is working to build awareness about a big member benefit available through www.bigimarkets.com: access to Architects and Engineers Professional Liability from CBIC, an RLI company. The market potential for this product is impressive: an estimated written premium of $500 million in the U.S. CBIC is a leading writer of A&E and would like to work with Big "I" members to reach more of these accounts. No one knows their local businesses better than Big "I" members. Access this market leading product and enjoy highly competitive 12% commission with no direct appointment necessary. Your Big "I" Markets membership gives you direct access to this elite product. The program features A+ rated paper and a flexible, knowledgeable underwriting team, a tenured claims team with strong A/E experience, an admitted product, worldwide coverage and supplemental payments. Learn more about this opportunity with an informative webinar session on Friday, Feb. 24th. Clarence Sproul of CBIC will discuss the ins and outs of the product and program features. We will be discussing program history, program eligibility and program highlights. Join us for this free information session and learn how your agency can take advantage of this unique partnership with CBIC and Big "I" Markets. Today, the best prospects to your agency for environmental insurance are no longer environmental services firms. They are commercial property owners and managers. ARMR.network, a wholesale brokerage firm available through Big "I" Markets, is here to help. Did you know that CGL and property policies sold to commercial property owners and managers do not cover them or severely limit for environmental losses within their building? You are not alone! ARMR.network has created an innovative two-part product that combines environmental insurance and risk management for the best offering in the marketplace for commercial properties. The insurance part of the PERM product is a specially designed and priced environmental insurance policy to fill the environmental coverage gaps in property and liability policies. This PERM product is absolutely needed to fill the coverage gaps caused by the pollution, fungus, mold, bacteria, category 3 water, asbestos and lead exclusions found on general liability and property policies sold to commercial property owners and managers. The second part of the PERM product is the risk management piece that is available when your client purchases the environmental insurance policy. This risk management is a water intrusion loss prevention plan conducted by a fire and water restoration professional who will visit their property. An onsite visit will be conducted with the property manager to create a risk management plan for the property owner and manager. There is nothing else like it. Putting a PERM option into that renewal proposal will help protect you from a professional liability standpoint if your client finds itself with an uninsured environmental loss. You will want to protect your agency with PERM. Providing the best product for your client is a great way to build your book of business with low risk, high premium accounts, while using the environmental insurance expertise of ARMR.network. To obtain an indication, ARMR.network just needs the statement of values/property schedule. How easy is that? The principals at ARMR.network invented the first contractors pollution liability policy and insurance specifications. ARMR.network can help agents with any environmental insurance risks. With in-the field experience which includes consulting for the United States Army, the Environmental Protection Agency and the Justice Department, ARMR.network can work with you to create the best pollution risk management strategy for your insureds and their businesses. To submit a quote request log in to www.bigimarkets.com and select "Pollution Contractors-Farms-USTs-Other" from the commercial lines menu, or call (608) 824-3341 and request a PERM option. Friday, February 24 - 2:00 - 3:00pm EST. 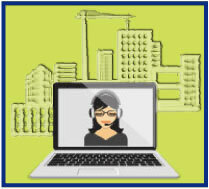 "Architects & Engineers Webinar with CBIC an RLI Company". Big "I" Markets is working to build awareness about a big member benefit available through www.bigimarkets.com: access to Architects and Engineers professional liability from CBIC, an RLI company. Learn more about this opportunity with an informative webinar session on Friday, Feb. 24th. Clarence Sproul of CBIC will discuss the ins and outs of the product and program features. We will be discussing program history, program eligibility and program highlights. Join us for this free information session and learn how your agency can take advantage of this unique partnership with CBIC and Big "I" Markets. Click here to register. NEW - Tuesday, February 28 - 2:00 - 3:00pm EST. "Chubb Masterpiece - Overview ". Meghan Jackson, DC Business Development Manager for Chubb Personal Risk Services, will present a 'back to basics' view of the Chubb Masterpiece policy and contrast it with the ISO contract. The first webinar in what will be a larger educational series will review the various property policies offered (deluxe home, condo, co-op, city home, and vacation home) and the bells and whistles that come with each one. Click here to register. NEW - Wednesday, March 1 - 2:00 - 3:00pm EST. "AIG Private Client Group - Collections". Join Lisa Gelles, AIG Private Client Group Business Development Manager as she breaks down AIG's Private Collections product. She will discuss the various coverages and services provided to your clients for their valuable collections. Click here to register. I was just a part of an investigation recently on strategies for very large insureds to purchase high limit excess liability insurance in the most tax-efficient way. As part of that investigation I was surprised to see what is summarized below. That is, that surplus lines (aka excess & surplus Lines, E&S or non-admitted) insurance placement taxes vary dramatically from a low of 1% to a high of 7%. With premiums under consideration of $500,000 to $1 million, that is a $30,000 to $60,000 swing in net cost for the coverage. 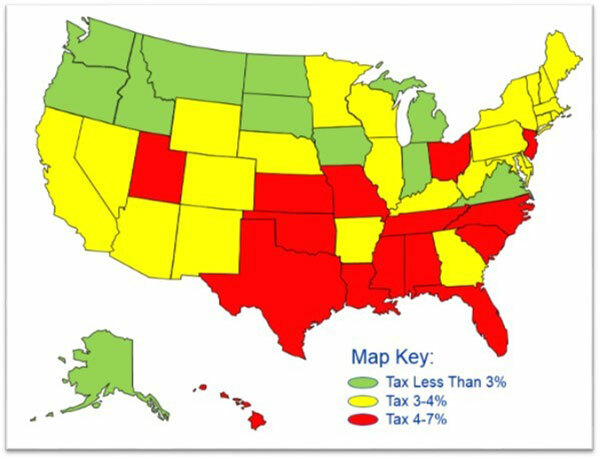 The other surprise to me after all these years in the business is that arriving at an exact property/casualty surplus lines tax figure for each state is not always clear cut. If fact, finding a concise table was not easy. Below is an approximate summary I did of low-medium-high tax jurisdictions but depending on the exact line of business and situation of the insured, the actual tax could vary. If you are curious on the details in your state, the NAIC has an 850-page guide summarizing the data state-by-state and each state and situation taken one at a time is more manageable. If you want that guide to look up your state, just email me and I'll send you the link. Source: National Association of Insurance Commissioners (NAIC) and the Center for Insurance Policy and Research (2016): "Retaliation Guide". Congratulations to our agent in New York on an Architects & Engineers Professional Liability sale of $2,618 in premium!